Do you love to travel but don’t like leaving your pet behind? Traveling with pets is a growing trend, mostly among dog owners. In fact, the percentage of dog owners taking their pets on trips doubled from 20 percent to 40 percent in recent years, according to a survey by the American Pet Products Association. Even with international travel, thanks to the increased popularity of pet-friendly hotels and airlines, more people are taking their faithful four-legged friend with them on vacation. Costa Rica is a very dog friendly country and pets are welcome more than ever at pet-friendly hotels around the country. What’s required to travel with my dog to Costa Rica? There is no quarantine imposed on pets in Costa Rica, but there are specific requirements that must be met. Here are tips and resources for those animal lovers who can’t bear to leave their furry family members behind. The Costa Rica travel blog My Tan Feet has a great guide to bringing your dog to Costa Rica from the U.S. and vice versa. PetTravel.com has excellent step-by-step recommendations for airline travel with your pet and information on regulations for pets entering Costa Rica. The U.S. Embassy in Costa Rica also has good information on traveling with your pet to Costa Rica. Driving around Costa Rica while on holiday is the easiest way to travel with your pet. You’ll have more flexibility and can make frequent pit stops for Fido or Fluffy to “do their business.” Here are some of the best pet-friendly hotels in Costa Rica, from the Central Valley to the beach. 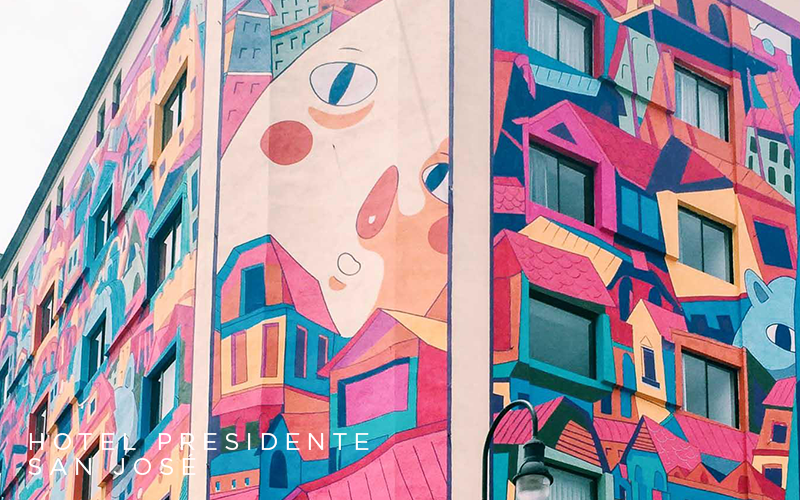 Located in the heart of downtown San Jose on the Central Avenue Pedestrian Boulevard, Hotel Presidente is an excellent choice for staying in the city. Many of Costa Rica’s best museums and galleries, as well as public parks, shops, restaurants and bars are within easy walking distance from the hotel. Besides a generous complimentary breakfast and free Wi-Fi, Hotel Presidente holds a “4 leaf” rating by the Costa Rican Tourist Board’s Certification for Sustainable Tourism Program. Their beautiful, elegant rooftop bar and restaurant has possibly the best view ever of downtown San Jose. Designed for extended stays, the hotel is strategically located within walking distance to CIMA Hospital and is adjacent to Avenida Escazú mall. Modern suites feature spacious living areas, fully-equipped kitchens and complimentary Wi-Fi. A free breakfast buffet will start your morning right. The Residence Inn’s pet-friendly policy lets you bring your four-legged friend with you for a $100 USD non-refundable fee per stay. 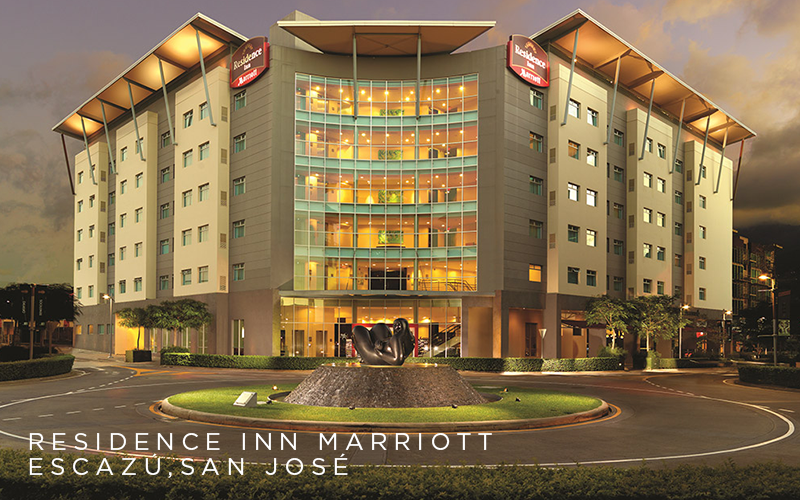 Casa Conde Hotel & Suites is located in a residential neighborhood in San Jose, five minutes from downtown. The colonial-inspired boutique hotel has 100 luxury suites, each with two rooms, a kitchen, living room, free Wi-Fi and 24-hour concierge service. Pets are welcome, and are limited to one pet per room. There is a $20 USD fee per day for pets to stay. See all of Casa Conde’s pet rules here. 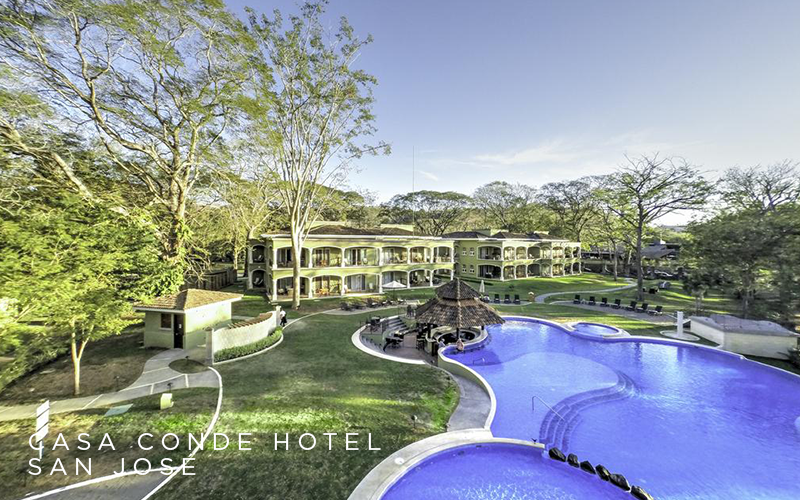 Casa Conde also operates a beachfront all-inclusive resort at Playa Panama in Guanacaste. For more than two decades, the Xandari Resort has been an oasis of unique architecture, colorful eclectic art and lush gardens in the coffee plantation hills above the city of Alajuela and the Juan Santamaria International Airport. The 24 spacious, individual villas are nestled on a 40-acre coffee plantation that includes a private forest reserve, a river with five natural waterfalls, and 2.5 miles of trails. 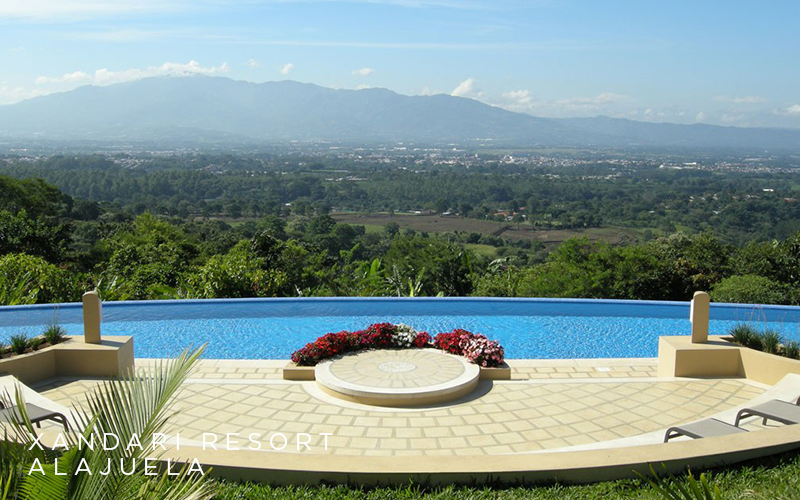 Guests have access to excellent hiking, bird watching, nature, pools, a spa, and spectacular views of Costa Rica's majestic Central Valley day and night. There is also a beautiful orchid garden, and a greenhouse where you can see some of the fresh, organic products growing that are served in Xandari’s restaurant. Sustainability underlines every effort at Xandari, and they have a four out of five sustainability rating in the Costa Rican Tourist Board’s Certification for Sustainable Tourism Program. The original owners of Xandari Resort were dog lovers and the hotel has been dog-friendly from the beginning. Check with their reservations department for specific policies. 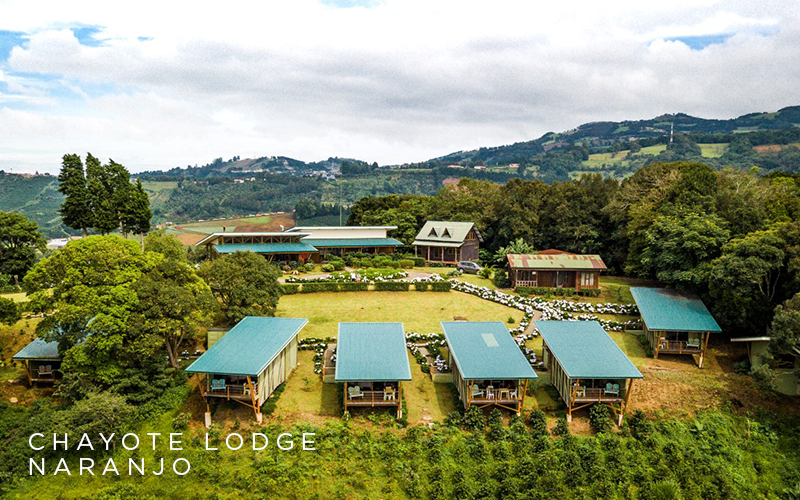 Chayote Lodge combines distinctive aspects of Costa Rican culture and nature to share with its guests the authentic lifestyle and traditions of the Central Valley countryside. Inspired by the coffee and farming culture of the region, Chayote Lodge’s architecture and design reflect Costa Rica’s rich coffee history. Its location in the small village of Llano Bonito de Naranjo in the northwestern corner of the mountainous Central Valley, 50 minutes from the San Jose international airport, is perfect to start or end a vacation in Costa Rica. It is also on the way to the Arenal Volcano. Twelve spacious bungalows are set on a hilltop at 5,400 feet above sea level (1,500 meters) in the cloud forest, surrounded by coffee fields. Views of Poas, Barva, Turrialba and Irazu volcanoes, as well as the Central Valley and the Nicoya Gulf in the Pacific Ocean (on clear days) are breathtaking. Chayote is the name of a locally-grown squash that is a popular ingredient in Costa Rican cuisine. Chayote Lodge is a pet-friendly hotel. Check with their reservations department for specific rules. This adults-only, contemporary luxury hotel is located on the Central Pacific Coast between the fishing port of Quepos and the world-famous Manuel Antonio National Park. 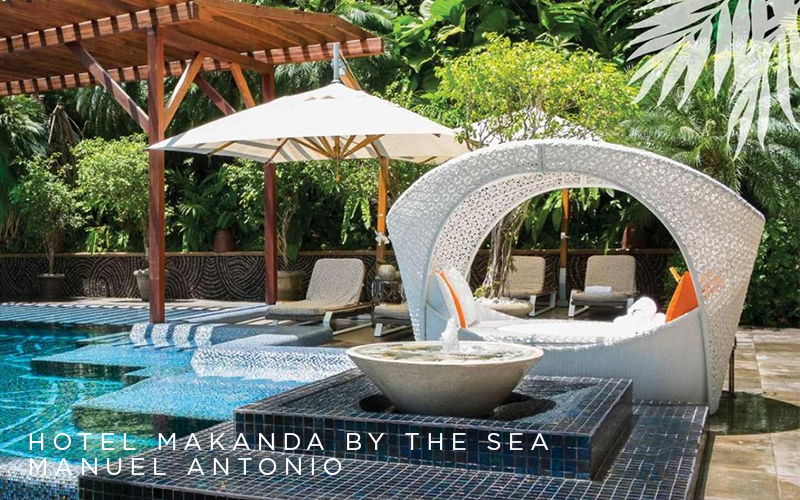 Set 100 meters above the beach and ocean, all of Makanda’s stylish villas and studios are surrounded by botanical rainforest gardens and offer spectacular views of the 60-mile-long coastline and breathtaking sunsets. Monkeys, toucans, sloths and coatis frolic in their forest reserve, and the beach is only a four-minute walk. Full breakfast is complimentary. Hotel Makanda by the Sea allows guests to bring one pet, weighing 10 kg or less, for no additional fee.